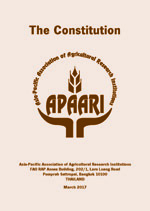 The Constitution of APAARI was adopted in December, 1990 by the General Assembly in its second meeting held at FAO Regional Office for Asia and the Pacific, Bangkok, Thailand. The first edition of the Constitution was published in December 1991, second in September 1994, third in February 2003, fourth in January 2009, fifth in January 2015 and sixth in March 2017. It has 17 Articles and 32 paragraphs covering the name, seat, objectives, functions, members, membership subscription, other sources of funds, the general assembly, duties of general assembly, executive committee, duties of the executive committee, executive secretary and secretariat, duties of officers, rules and regulations, quorum, amendment of the constitution and dissolution. Have decided to establish a neutral and apolitical regional association of agricultural research institutions in the pursuit of their common objectives (under the sponsorship of FAO). 2. The name of this association shall be “Asia-Pacific Association of Agricultural Research Institutions”, and the acronym will be ‘APAARI’, hereinafter referred to as the Association. The logo of the association comprises of two hands opening sideways and with the full name of the Association arched over them, forming an umbrella. A grain earhead in the middle of the logo is in recognition of the strength that agriculture provides in sustenance of the region. The green colour of the hands and the grain ear head symbolizes prosperous agriculture. 3. The Association shall have its seat at Bangkok, Thailand. d. Strengthen cross-linkages between national, regional and international research centres and organizations, including universities, through involvement in jointly planned research and training programmes. e. Promote collaborative research among member institutions, including need-based support to regional research networks. e.Promote collaborative research among member institutions. c. Reciprocal members: Other regional/global ARD fora that recognize APAARI also as their member with condition of mutual waiver of any membership fee. d. Affiliate Members: Agricultural universities and research institutions beside NARS, but with no voting right. 8. Any member institution desiring to withdraw from the Association shall notify to the Executive Secretary in writing, and such withdrawal shall take effect three months from the date of receipt of the notice by the Executive Secretary. 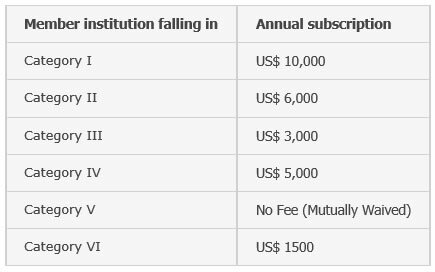 The subscription falls due on 1st January every year. c. Fees, if any, collected from participants of any technical meeting organized by the Association. 11. There shall be a General Assembly of the Association, in which each member institution shall be represented by one delegate. 12. The General Assembly shall meet at least once every two years. 13. Each regular member organization of the Association shall have one vote at the General Assembly for voting at ordinary or extraordinary meetings. The Chairman shall allow some time for mutual consultation among members prior to voting on any issue. 14. All decisions shall be taken by a simple majority vote, except for those decisions relating to amendments to the Constitution, and those related to the dissolution of the Association. In the case of equality of votes, the Chairman shall have a casting vote. 15. In fulfilment of its objectives, the General Assembly shall determine the policy of the Association, approve the programme of work and budget formulated and put up by the Executive Committee, review progress, and shall exercise other powers conferred upon it by the Constitution. 16. The Association shall have a 14 member Executive Committee, composed of: Six members representing NARS – two each from the Pacific, South-East Asia and South-West Asia sub-regions; one ex-officio member – the incumbent Executive Secretary of the Global Forum on Agricultural Research (GFAR); one ex-officio member represented by one of the CGIAR center Directors General being associate members on rotational basis; two members from civil society organizations (CSOs) – one from regional farmers’ associations and one from NGO’s associations/communities; one representative of the private sector; one member representing the Association of International Research and Development Centers for Agriculture (AIRCA); one member representing the higher education sector (universities); and the incumbent Executive Secretary of APAARI as ex-officio member. The Chairman, Vice-Chairman, and other members shall be elected/nominated by the General Assembly from among the regular member institutions at the biennial meeting. They shall hold the office for two years and shall not be eligible for immediate re-election to the same office. However, the outgoing Chairman will continue as a member for the next term to ensure continuity and needed guidance. The Executive Secretary of APAARI shall be appointed according to Article XII, Paragraph 22. No country NARS members will have more than one representative on the Executive Committee. 17. If any one of the offices of Chairman or Vice-Chairman becomes vacant for any reason, the remaining members of the Executive Committee shall elect one of its own members to fill the vacancy. A position of member of the Executive Committee, which falls vacant shall be filled by the next candidate who has the highest number of votes in the election of the Executive Committee at the preceding General Assembly. The persons who become members of the Executive Committee under this provision will remain in office until the next Session of the General Assembly. 18. The Executive Committee shall manage the affairs of the Association in accordance with this Constitution and the policies and directives adopted by the General Assembly. 19. The Executive Committee shall report to the Assembly on the implementation of the approved programme of work and the progress made in fulfilling the objectives of the Association. 20. The Executive Committee shall meet at least once every year and shall be convened by the Executive Secretary. 21. Secretariat of the Association shall be headed by the Executive Secretary. 22. The Executive Committee shall appoint/elect/nominate the Executive Secretary, either on honorary or payment basis for a given tenure of two years, renewable each time based on performance assessment by the Executive Committee, and approval by General Assembly, with suitable experience and acknowledged leadership in agricultural research. He/she will be supported by minimal technical and administrative staff in the Secretariat office. 23. The Chairperson shall preside at all meetings of the General Assembly and the Executive Committee. 24. The Vice-Chair shall perform all duties of the Chairperson in the absence of the latter, and such other duties as may be assigned to him/her by the Chairperson. 25. The Executive Secretary shall be the chief of the Secretariat of the Association. He/she shall be responsible for the affairs of the Association and execution of all activities approved by the General Assembly, including preparation of programme of work and budget, monitoring of progress, and arrangement for meetings of the General Assembly and Executive Committee. He/she shall collect and disseminate information pertaining to the activities of the Association. He/she shall prepare the minutes for the Assembly and Executive Committee meetings, and arrange for the publication, distribution and maintenance of the reports and proceedings of all meetings of the Association. He/she shall receive annual subscriptions and any other financial contributions to the Association, account for all money received and make payments in accordance with policies established by the General Assembly and the Executive Committee. He/she shall submit audited accounts to the biennial General Assembly. 26. The General Rules of Procedure and Financial Regulations shall be prepared by the Executive Committee and approved by the General Assembly of the Association. Amendments to the Rules and Regulations may be adopted by a simple majority vote at any session of the General assembly. 27. The Executive Secretary shall be responsible for utilization of the approved budget of the Association and shall maintain full accounts, records and documents. Duly audited accounts shall be presented to the General Assembly. 28. The quorum shall be 50 % of the membership at all General Assembly and the Executive Committee meetings. 29. Amendments of the Constitution shall be considered only at a meeting of the General Assembly. 30. The Association may amend this Constitution by a two-third majority of the votes cast, provided that such majority is more than half of the countries from which the membership of the Association is drawn. 31. No proposal for the amendment of the Constitution shall be included in the agenda of any General Assembly unless notice thereof has been dispatched by the Executive Secretary to members at least 60 days before the opening of the meeting. 32. The Association can only be dissolved by a resolution approved at a General Assembly. The procedure to be followed for the dissolution of the association shall be same as detailed in paragraphs 30 and 31 under Article XVI.